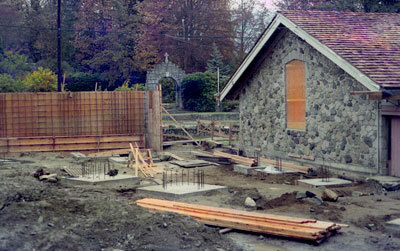 Construction of the West Vancouver Memorial Library West Wing addition. This view is looking North from the back of the building. The West Vancouver Memorial Arch can be seen in the background across Marine Drive. Scanned August 2013 using Epson Perfection V700 Photo at 300dpi and 100% of original negative size. Alternate Versions: Lossless TIF from original scan at 300dpi and 100% of original negative.35mm colour gelatin emulsion negative.